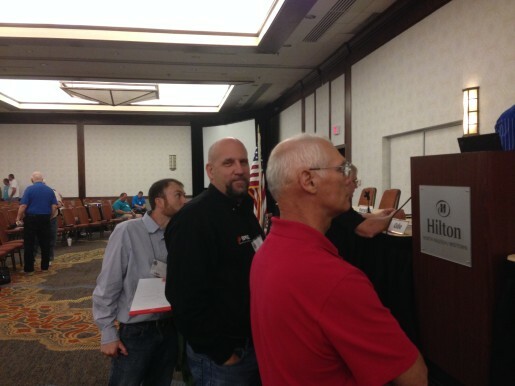 Bear Rock Electric, Inc. (BRE) Superintendent Chris Albrecht and Lead Mechanic Eric Albrecht attended the 86th Annual Meeting of the North Carolina Electrical Institute (NCIAEI), held April 7-8, 2015 in Raleigh, North Carolina. The Institute is an educational program presented and sponsored by the NC Ellis Cannady Chapter of the International Association of Electrical Inspectors (IAEI), the State Board of Examiners of Electrical Contractors, and the Engineering Division of the Office of the State Fire Marshal, NC Department of Insurance. The program welcomed over 700 contractors, inspectors, suppliers, distributors, manufacturers, testing agencies, and industry representatives. The Institute featured an Electrical Code Workshop during which nationally recognized Code experts answered questions submitted by parties throughout North Carolina. Also featured was a presentation on the 2014 National Electrical Code (NEC) Analysis of Code Changes, discussing legal issues and the NC Electrical Contractors’ Laws and Rules, as well as a presentation on Grounding Electrode Connecting to Earth. education programs. While this year’s Institute was not formatted as one such program, attendees were able to receive eight contact hours of continuing education credit, as granted by the NC Board of Examiners of Electrical Contractor and the NC Code Officials Qualification Board.